If you are not a grapefruit lover…this might be the recipe that changes your mind. This is a beautiful and delicious way to start your day. 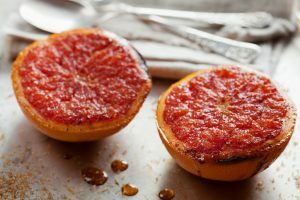 If you are in a rush…you can speed this process along by broiling the grapefruit for a few minutes rather than baking them. In the words of my daughter, “easy peasy, lemon squeezy”. I love a recipe that is fast, easy and delicious….this one is a winner! Bake at 375F for 15 minutes.